Wow it’s been a while since I last posted! I don’t really have a good excuse other than I have not been feeling inclined to share what I’ve been cooking, which has mostly been some iteration of vegetables, boiled or sauteed together, usually on top of some grain. I also did not want to give you guys another sweet recipe, because the ratio of sweet to savory is getting out of hand and if I don’t inject some salt into this blog it’s going to get diabetes. 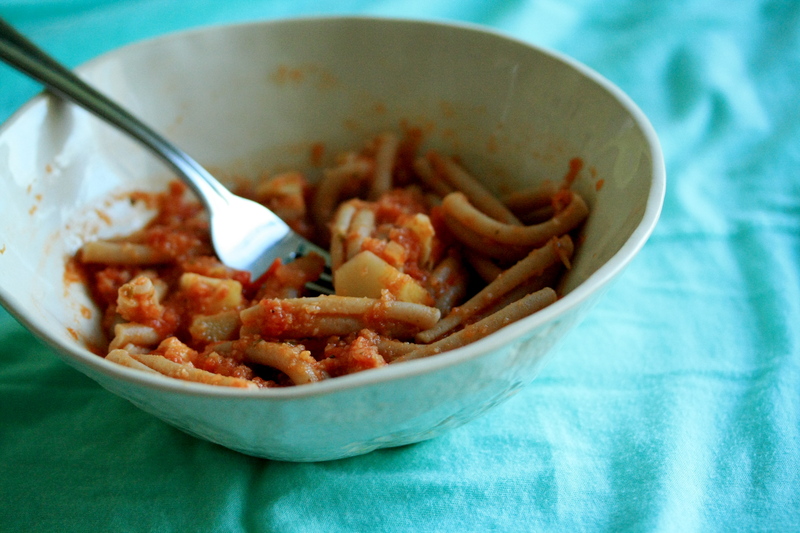 Anyways, this probably isn’t the most exciting recipe you’ve ever seen, but I was inspired by a pasta I ate this summer in Rome (how sickeningly cliché, I know). I went with some Roman friends to a spaghetteria called L’Archetto, where, unsurprisingly, the specialty item on the extensive menu was spaghetti in numerous, sometimes ridiculous dressings (melon and pineapple spaghetti anyone?). It was really hard to choose which one to get, and after much deliberation I settled on a spaghetti with tomato sauce and cauliflower. I’m pretty sure I selected that one because it seemed light and I had been eating a lot during the trip, not because cauliflower is my favorite vegetable. Broccoli is far superior. Anyways, the pasta was really good, so when I bought a small head of cauliflower from the farmer’s market this week I decided to recreate the dish, minus the spaghetti because all I have is gemelli. While you heat some olive oil in a saucepan, chop 1/4 of the onion and the garlic clove, then sautee until translucent. Add in the cauliflower, chopped, and sautee it until it acquires some color. Add in the canned tomatoes, pureed if you like, and about 1/4 cup of water and simmer for about 20 minutes. Season with salt, pepper and basil leaves. 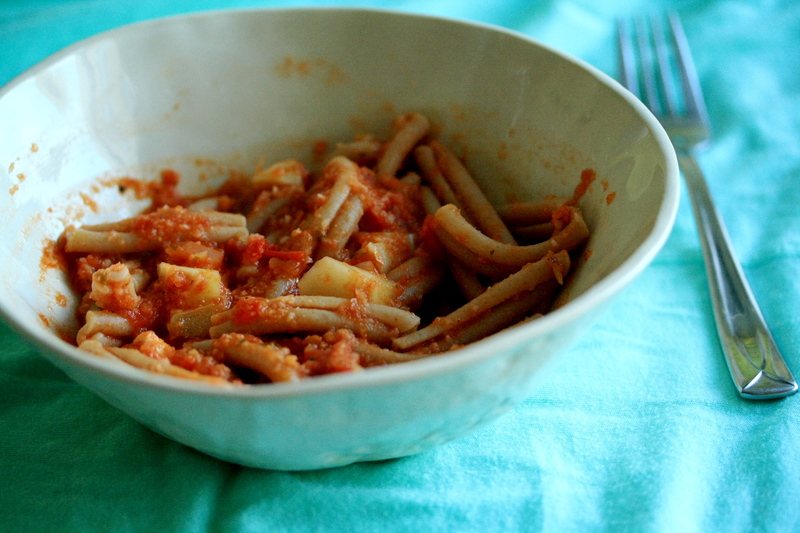 Serve the sauce over a pasta of your choice, I chose Severino brand whole wheat gemelli, because they are awesome. Looks de-lish. Am going to try it this week.